By default, your user role defines the level of access you have to Skytap resources (environments, templates, and assets). If you are a standard user or user manager, you have access only to the Skytap environments, templates, and assets you create. With projects, you can share resources that you own with other Skytap users and user groups. Projects provide a framework for setting user permissions on select environments, templates, and assets. The set of resources (environments, templates, and/or assets) added to the project. The users and groups who have permissions to view, use, edit, and/or manage resources in the project; these permissions are granted by assigning a project role to each user or group in the project. Any Skytap standard user, user manager, and administrator can create a project and use it to share resources with other Skytap users. Administrators, regardless of project permissions, have permission to view, edit, and manage all environments, templates, and assets in the account. Your company account can have up to 1500 projects. 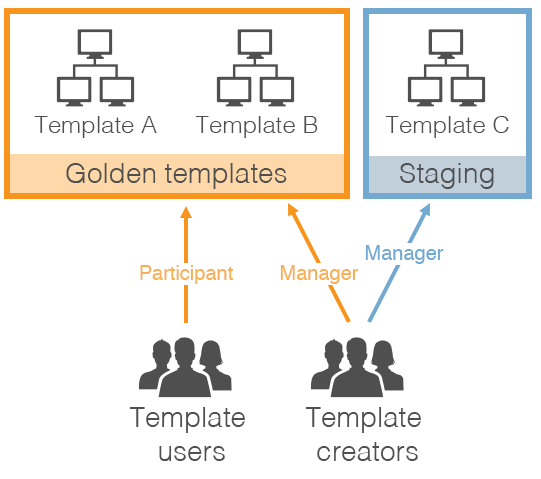 Scenario: Let’s say you want to control and manage a set of company-wide golden templates in your customer account. You want a small set of users to maintain the templates (template creators), and you want all other users in the account to have permission to create environments from those templates (template users). Golden Templates – Use this project to share golden templates with all users. Add all finalized, approved templates to this project. Add templates to the project or remove templates from the project. Add users to the project or remove users from the project. Add all other Skytap users to the project in the Participant role. Participants can create environments from templates in the project. Enable an automatic role on the project. With this setting, every new Skytap user is automatically added to this project as a Participant. Staging – Use this project to share in-progress environments and templates between template creators. Add new, in-progress environments and templates to this project. Add template creators to the project in the Manager role. Do not add other Skytap users to this project. Because they don’t have project access, they cannot view or use environments and templates in this project. To create a project, see Create, edit, or delete a project. To add users or groups to a project (and to assign project roles), see Adding and removing users in a project. For information about locating resources that have been shared with you, see Finding project resources. For more information about automatically adding all new users to a single project, see Automatically adding new users to a project.